4 months back i had blogged about How Mediatek (MTK) would disrupt tablet markets in SouthEast Asian Markets. According to the latest tablet CPU share report from Strategy Analytics, MediaTek is on a roll in the tablet space, now practically tied with Samsung as the second biggest supplier of tablet chipsets. The global tablet processor market registered 46 percent year-on-year growth to reach USD 759 million in the second quarter. Apple still dominates the market with its A5 and A6X processors and it enjoyed a 34% revenue share in the second quarter. Samsung and MediaTek had about 10% each, although Samsung was in a slim lead. Marvell and Qualcomm also made some progress in Q2, while Intel and Nvidia are expected to gain share in the second half of the year. 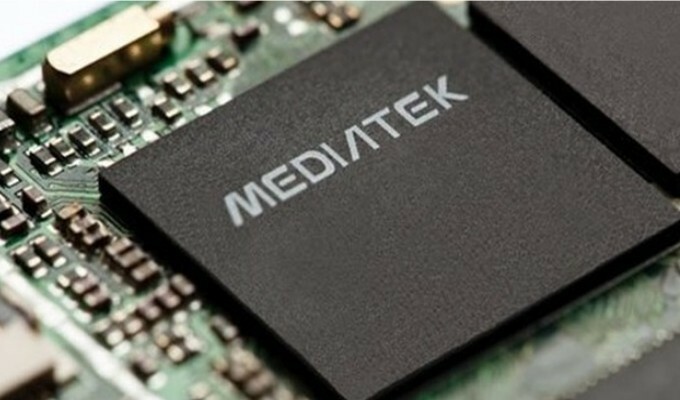 MediaTek scored significant design-wins with Acer, Asus and Lenovo. MediaTek’s tactics of releasing stand-alone applications processors for the tablet market coupled with its reference design know-how have propelled its share to double-digits in the tablet applications processor market. During Q2 2013, Marvell and Qualcomm also made good progress, thanks to their high-profile tablet design-wins. Strategy Analytics believes that Intel with its Bay Trail chip and NVIDIA with its Tegra 4 chip are also poised for tablet applications processor market share growth in the second half of 2013. 1. An ageing portfolio that never saw much in terms of innovation – There were always a handful of Blackberries – Storm, Bold, Curve, Torch – 4 devices through 4 critical years when Apple and Android stormed the markets. 2. The customer experience was very below average – The BES and BBM were great services – but Blackberry was mighty bland in designing experiences around the customer and these services. 3. In an age where Applications are key and must be scalable across platforms, BlackBerry apparently provided no incentive to port many older BB7 business apps that enterprise companies use to run on BB10 on launch. That was being stupid. 4. Blackberry misread the BYOD wave in enterprise, blinded by its past glory of securitized enterprise solution. The segment where Blackberry was unassailable till sometime back -has simply moved on to other solutions from companies like include Citrix, MobileIron, Maas360, Microsoft and Airwatch. 5. Customers today are averse to be bogged down in their choices- to a hardware with a service bundle. They value flexibility in terms of choosing their own device and “Appizing” it with enterprise and security features. 6. The Q10 and Z10 was a case of wrong targeting – Blackberry could have probably done better with mid level and entry level phones for the customer – Their carrier commitments would have given them some solid seeding in the market and made numbers happen. As the portfolio is now pruned, it is interesting to note that within 7 months of launch, the Z10 is now being re-positioned as a mid tier device for emerging markets. The concern still remians that Samsung is eating everybody’s lunch in the mid segments across markets. What do the current set of actions at Blackberry signify? Cutting the headcount hardly addresses any of Blackberry’s pressing needs of the day.However, I don’t think anybody could do much better with it. The current cuts helps cleans things up for any type of potential deal or acquisition that they’ve been very forthright about seeking. Beaten on Hardware and pushed out of its enterprise security space- It’s probably going to find limited value for most potential buyers.Cutting operating expenditures deep is the best they can do to try to stabilise this ship. Is Blackberry Attractive? What parts? Even if Blackberry were to dissolve its hardware arm and its services arm and use its services arm – it would hardly be a cake walk as one would otherwise expect. The BYOD and the Apps space has cannibalized Blackberry’s USP. It is hardly the incumbent in the enterprise market. Blackberry’s agreements and contracts with hundreds of mobile operators could be valuable to someone who has an intent to engineer a new mobile global network of devices or services (Apple, Google, Visa, Mastercard). So, what can Blackberry expect? The best Blackberry can hope for is a Nokia-style takeover, though who would actually take over is tough to imagine. It has been a pleasure. Au Revoir Blackberry! Blackberry’s white knights – Z10 and BB10 haven’t brought the moolah home. In the Q2 pre-released earnings call, Blackberry has said that it will take a $1 billion pre tax hit on the their bottomline. 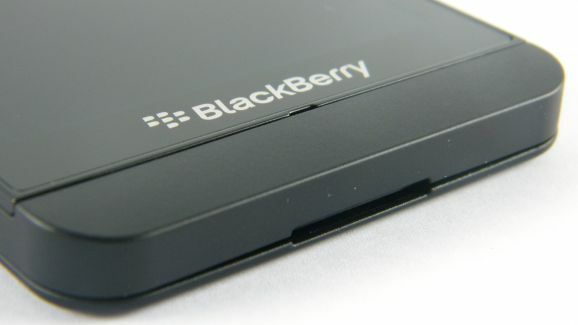 Much of this – about $950-$995 million is to do with unsold inventory of Z10 at Blackberry. Worse there is a 40% workforce cut on the cards. In Q2, Blackberry sold close a 5.7 million units to end customers. BlackBerry is now predicting total second-quarter revenue of about $1.6 billion, compared with Wall Street’s forecast for $3 billion. Interestingly enough the revenue from the BB10 devices has not been accounted for – and all the revenue is mostly from the legacy BB7 platform. I was always skeptical of Blackberry’s comeback attempt with the Z10 and BB10. Always felt that Blackberry was looking at the wrong end of the market to stay relevant. The good news is that it has a solid $2.6bn in cash and is debt free. The other is that the BBM would be made available to Android and iOS to increase its customer reach. 1. Sell out the unit as a whole. Going forward, BB is not only pruning its workforce but is cutting down its portfolio also, focussing on enterprise and prosumer-centric targeted devices, including 2 high-end devices and 2 entry-level devices in all-touch and QWERTY models. Blackberry is also supposed to be refocussing on end-to-end solution of hardware, software and services for enterprises and the productive, professional end user. This means that Blackberry is exiting the consumer market and getting back to its fort- the enterprise. In any case Blackberry now ceases to be the force it was in smartphones. Blackberry had its moments in smartphone folklore and history – and yet again the example of a mobile phone company – which was out innovated in the game. The cost and benefits of options and opportunities not taken can never be estimated in its entirety. The same could be said for Nokia rumoured move ( Plunge be abetter word) to Android. Before the 23rd August 2013, Nokia Microsoft deal was announced, Nokia was considering options in Android on Lumia. This isn’t surprising – rather it was in common sense not to load up all its devices on Windows platform. It was a huge risk- which i am not sure has benefitted Nokia. Stephen Elop has himself accepted that this move was not considered in 2010 because of the dominance of Samsung on the Android platform would have meant Nokia being relegated to a lesser-than-what-was-expected status in the Android hierarchy. Considering that Nokia lost market share from 32% in 20110 to 3% in 2013 – the Android shift as a plan B hardly comes as a surprise- rather it is much too obvious that the maturity of Android as a platform and the hardware competence and scale of Nokia would have made a great combination.Nokia would have saved money, reduced development costs and still play to its hardware design strengths. The Android scale would have also helped Nokia enter mid and low end of the smartphone markets earier, faster with greater acceptability. Nokia had an option to exit the partnership late next year, but that certainly can’t happen now. It’s interesting to think about how differently things could’ve gone if Nokia had decided to go with Google rather than Microsoft, but it looks like we’ll never know now. Apple has been one of the most innovative companies in the world. Based on the vision of Steve Jobs, it has created products that truly changed the world, such as the Macintosh, iPod, iPad, and App Store. Despite these accomplishments, Apple’s pace of innovation has slowed, causing the company to lose its edge as a market leader. Aside from creating products that delight consumers and starting an entire industry of app developers, Apple’s relentless and rapid drive for innovation has made investors wealthy. When the company released the iPod in 2001, Apple had less than $5.5 billion in revenue and its stock price hovered around $20; the company’s total market capitalization was $7 billion at that time. Today, Apple’s market capitalization is about $500 billion and its stock price is currently around $500. Apple’s poor record on innovation in recent years is also reflected in market share numbers. According to IDC, Android has 75% of the smartphone market, compared to Apple’s 17%. In addition, Samsung holds a much larger share of the world smartphone market than does Apple. Apple was once the leader, innovating rapidly and bringing the most interesting products in the world to market. Today, the company lives on past success and future promises, without the innovation we expect. So, yes, the lack of new products has hit Apple hard. For proof, look no farther than Apple’s poor stock performance, which is truly a measure of confidence in the company.Since Steve Jobs sad passing, Apple has released extensions to existing products rather than anything profoundly new. Product line extensions represent a natural evolution for established brands. For example, Apple has released new iPhones, faster laptops, and better screens on the iPad but nothing game changing since the original iPad. As Apple sits still, competitors are extending the concept of mobile devices and releasing numerous products. Samsung even introduced a smart watch ahead of Apple’s anticipated offering. With the iPhone 5C and 5S, one has to sadly acknowledge that Apple’s glory days of innovation are past. There are many who opine that Apple’s products are so good that short-term product delays don’t matter in the larger scheme of Apple greatness. This tempting argument is wrong, however, because the company has run out of “insanely great” ideas. That the real problem and explains why the company once known as the world’s innovation king is now relegated to product line extensions and little more. The iPhone 5C and 5S are great products – but they are not fundamentally new nor are they insanely great!! The Apple 5S is possibly short of what it takes to keep Apple out in front. The iPhone 5S and 5C have been announced – and unlike the earlier Apple keynotes have not been able to set the fanboys, device geeks and blogosphere ablaze as is customary. Between the iPhone 5C and 5S, Apple finds itself caught in the middle of nowehere. At $599, iPhone5C is not exactly mid range and it remains to be a Veblen. It remains to be seen if the iPhone 5C with 2 year contract is able to turn the volumes for Apple – the way it would want to. 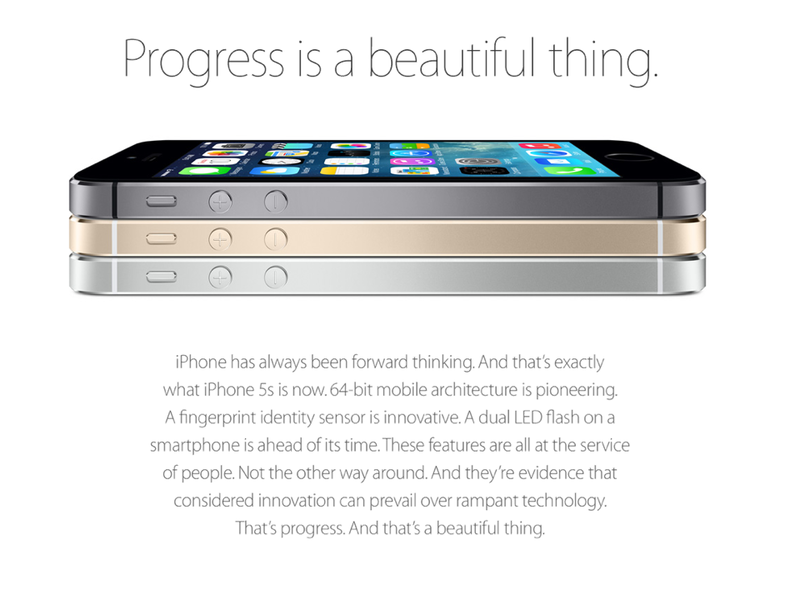 However, to me the greater dissappointment is the iPhone5S. Innovation can be looked under a 2-axis paradigm. The Vertical axis is an addition of a feature (e.g Siri, Retina Scroll etc); the Horizontal axis is the enhancement of a feature (e.g 8MP with dual flash over 5MP). The 5S scores minimally in the vertical axis and most of the additions are mostly on the horizontal axis. 5. 64Bit mobile architecture and a new A7 chip – While the jury is still out on this.. but agreeably there will be some additions to speeds, performance, feel, battery life, processing power etc. (+1 on Vertical axis). For the 64bit architecture to show true colours, Apple will need to have an eco-system of Apps. There you have it…. Apple’s iPhone 5S has 2 0s, 3 on Horizontal axis and 2 on Vertical axis. Thats not very Apple-esque. The greatest grouse with Apple is taking the screen size ahead… With a 4″ screen, Apple is atleast 50% behind the 5.7-6″ form factors. The larger size screens have led the growth of the Android high end devices by leaps and bounds over the last 2 years. In 2012, when Apple announced the 4″ form factir it had seen large migrationsfrom the earlier 3.5″ Apple devices which really helped garnering record volumes. 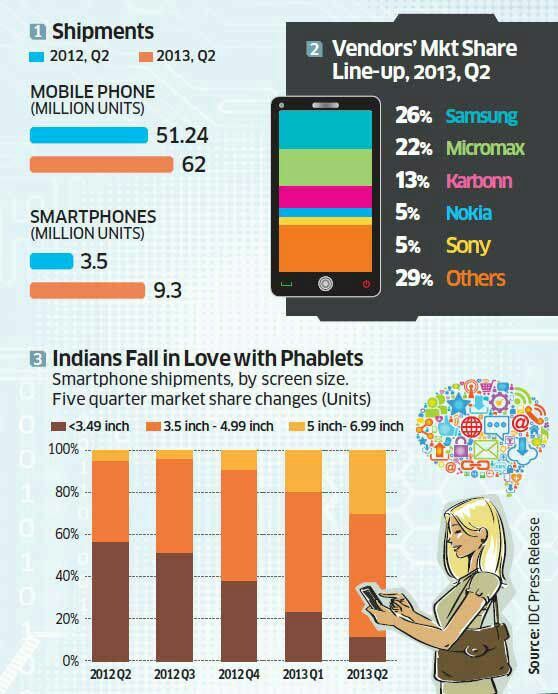 The success of the larger form factors is evident from the fact that Smartphones with screen sizes of 5- to just under 7-inch, colloquially known as phablets, overtook shipments of each of the portable PC and tablet device categories in Asia Pacific (excluding Japan) in the second quarter of 2013, according to IDC. Will Amazon do a Gillette? Guess the latest gate crasher on the Smartphone party? The rumours have been doing rounds for a while now – But Amazon, the king of digital distribution seems set to take on the likes of Apple, Google and Samsung on smartphones. Amazon already has a current portfolio of Kindle Fire tablets and Kindle eBooks – and is reported closing down on 2 smartphones and 1 audio streaming device. One of the devices that Amazon is working on is a 3D screen smartphone. Details are sketchy – but this could be Amazon’s flagship device – with retina movement sensors and a 3D effect overlay.Also of interest is the rumour that Amazon could release a smartphone for its consumers free of charge without a wireless contract. That could be a very significant departure in pricing strategy in smartphones. The smartphone game is changing. New smartphone entrants Amazon and Google are beginning to generate revenue primarily through e-commerce sales and online advertising, respectively. As such, they are more willing than their competitors to sacrifice device profit for market share and reach to build on their digital distribution networks. Its interesting to see how the Apples, Samsungs, Microsoft-Nokia’s of the world react to Amazon’s disrupting pricing. Amazon is doing a Gillete with a easy entry price for the razors and making the consumers pay for catridges. 1. The key for Amazon is to establish a user experience and interface so uniquely engaging that users would stayed hooked to it. Associate that to the Gillette shaving experience and how the user was not able to get rid of the Gillette habit and would spend more and more monies on catridges, foams and others… Yes, Amazon must do the Gillette magic. 2. It has the digital content that can upend a lot of device-only players – such as Samsung. 3. Also key to this equation is the reach and penetration of Digital content in the third world countries – it will require a lot of different other monetization models for Amazon to get threshold volumes in such markets. Will Apple’s “Volksphone” re-invent its Smartphone strategy? In 2007, Steve Jobs launched the iPhone and created the touchscreen Smartphone category. Apple had a 5 year window of opportunity and dominance, before Android touchscreen smartphones of comparable quality came anywhere close to the iPhone. Android rode on its strengths combined with Samsung’s distribution and LCD panel strengths to finally offer a comparable device to the iPhone in 2012. Android was also quick to capitalize on the low end opportunity to create volumes for itself as Samsung built dominance in smartphones with successive launches of Galaxy Note and Galaxy S series phones. In the coming months, Apple will see a shift in strategy in the way it has driven iPhone with the launch of iPhone 5C.Its equivalent to Apple “Volksphones” – a device that targets the mid range of the markets. in doing so, Apple would go back to Jobs’s 1997 advice to Apple: take everything of value you can from the leading product and repurpose it into the next great thing. Arguably, iPhone has hit its peak aand the way forward would be a decline if it were to persue a high end – high margin – low volume strategy. Instead Apple will now need to shift its strategy from high end – high margin- low volume to mid segment- low margin – high volume strategy. If Apple were to do this, it would be marked shift from the strategy that it has successfully pursued this far. In order to stay relevant and stay in the game, Apple would have to risk cannibalizing its high-end line (while continuing to add to its specs), by repurposing their resources into a mass-market device. There could be additional pickings through the iCloud, Siri and its Application store. Interestingly enough Apple would need to open to other arrangements such as Operator billing for Applications bought on the Apps store. Apple has already reworked iOS into tablets and the AppleTV, and seems to have a vision for a wearable next device / phone peripheral – iWatch. Also the new Macpro by Apple, promises to be a technology disruptor with new and very high end media or gaming experiences. Thus Apple’s technology flagships are now poised to change from the iPhone/iPad to other devices – most signficatly the iWatch. Apple has had a great run with its currently-for-sale smartphone strategy, but nobody, including certainly Apple, assumes it can continue. The question is how quickly they can re-invent the smartphone… again. 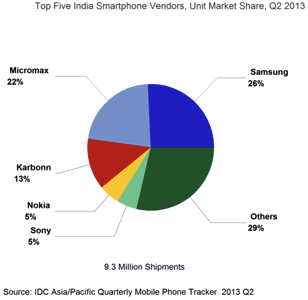 The total mobile phone shipments increased by 4% QoQ and 21% YoY in the country. The feature phone market is declining but still accounts for 85% of the mobile phone market in the country. Shipments of smartphones between 3.49-inch and 4.99-inch has also increased significantly over the past few quarters and now account for the majority of smartphone shipments for the quarter Smartphones less than 3.49-inch has dropped massively and now accounts for only a small portion of the smartphone shipments. Windows Phone has taken 5.6% market share in India, largely on the strength of Nokia’s smartphones, which had 5% of the market. – Samsung continues to lead the smartphone market with 26% market share, driven by shipments of low end Samsung Galaxy Star and other mid range smartphones. Samsung’s massive aggressive marketing in the country has a significant contribution to this. – Micromax has 23% smartphone market share and has crossed 2 million shipment units, significantly driven by Micromax’s Canvas series. – Karbonn has 13% smartphone market share which has apparently seen an uptick in its A series and the newly launched Titanium range of smartphones. – Nokia has 5% smartphone market share which has apparently seen an increase in Nokia Lumia 520 sales volume. Dedicated advertising and marketing push towards positioning Lumia phones as a quicker and cooler replacement to other brands is working in its favor. Nokia is still feel the growth is still very slow as compared to other players, primarily due to the Windows Phone 8 operating system which is is slowly filling all the major gaps in the software but is still quite nascent as compared to its iOS and Android counterparts. – Sony also has 5% smartphone market share and IDC says Sony’s mid tier phones and low end dual SIM phones are doing well.